Send someone special a caramel apple gift that’s so indulgent they won’t even miss the stick. We start by plunging wedges of tart, perfectly ripe jumbo Granny Smith apples in gooey caramel—4 are then dipped in rich milk chocolate and finished with chopped almonds, 4 are dipped in rich milk chocolate and sprinkled with shaved coconut and 4 are dipped in creamy white confection and dusted with snappy cinnamon sugar. This gift is exceptionally fresh and requires 2-day delivery. Send someone special a caramel apple gift that's so indulgent they won't even miss the stick. 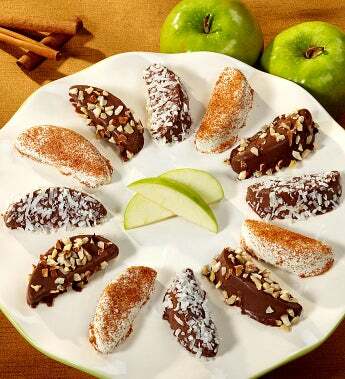 We start by plunging wedges of tart, perfectly ripe jumbo Granny Smith apples in gooey caramel—4 are then dipped in rich milk chocolate and finished with chopped almonds, 4 are dipped in rich milk chocolate and sprinkled with shaved coconut and 4 are dipped in creamy white confection and dusted with snappy cinnamon sugar.